WHAT IS IT? Few Americans know that Scalvini owner Gianluigi Scalvini is a former 125cc and 250cc GP road race winner. His experience with high-performance two-stroke road racers led him to design his own line of exhaust pipes—each one completely handmade and welded by Italian artisans. WHAT’S IT COST? $279.00 (cone pipe), $175.00 (aluminum/carbon silencer), $247.00 (full carbon silencer). CONTACT? www.scalvinipipes.com or (760) 949-0941. WHAT STANDS OUT? 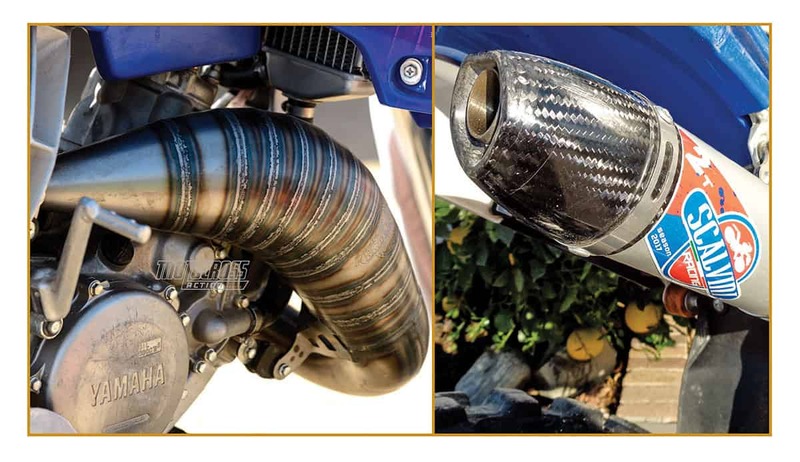 Here’s a list of things that stand out with the Scalvini Yamaha YZ125 cone pipe and aluminum silencer. (1) Cone pipe. It should come as no surprise that most Scalvini buyers are attracted to the exotic look of the multiple welds of a cone pipe. Modern pipe builders have eschewed cone pipes because they are labor-intensive and time-consuming to make. Scalvini is the king of cone pipes and the choice of two-stroke builders looking for something very special, whether for a KTM 50SX or Honda CR500. (2) Construction. It’s an arduous task to weld flat pieces of steel into circular tubes, jigsaw the metal loops together, grind down the welds and then pound the joints with a mallet to produce a smooth shape. It should be noted that a Scalvini pipe isn’t comprised entirely of cones. The head pipe is stamped to lessen manufacturing time, which helps lower the price tag. A Scalvini cone pipe costs $40 more than a competitor’s stamped pipe. (3) Installation. The hardest part of installing the Scalvini pipe on our 2018 YZ125 is forming the P-clamp silencer hanger into the perfect shape. We used to struggle with getting it all lined up, but on the 2018 YZ125 it was perfect the first time. (4) Performance. If the Scalvini YZ125 pipe didn’t add a single horsepower, people would still buy it—it looks that good. The performance of the Scalvini YZ125 pipe was altered by whether we ran the Scalvini silencer or the stock YZ125 silencer. With the stock silencer, the YZ125’s power was more focused on the midrange with a touch of over-rev. With the Scalvini pipe and Scalvini silencer, we traded bottom-end power for top-end. The system pulled further into the rpm range, had more over-rev and gained 2 horsepower at peak, which was also a couple hundred rpm higher; however, the Scalvini duet made the YZ125 peakier and harder to keep in the sweet spot. Test riders were split on which pipe/silencer combination was best. Faster test riders chose Scalvini/Scalvini; slower test riders chose Scalvini/YZ. WHAT’S THE SQUAWK? At the front of the powerband, from low to mid, neither Scalvini combination could make a significant improvement over the stock pipe. It wasn’t worse than the stock YZ125 pipe from 6000 to 9500 rpm, but it wasn’t better either. After 9500 rpm, the Scalvini showed a notable improvement. MXA RATING: We would rate the Scalvini pipe and silencer as an Intermediate-and-up winner, but Novices and Vets will have to push too hard to take advantage of the top-end-only powerband. On the other hand, whether you can get the engine to sing at high rpm or not, the Scalvini makes your YZ125 look “zoot capri,” as we used to say when cone pipes were commonplace.